In this tutorials we are exploring Absynth as an FX unit. There are many uses of Absynth as a classic effect unit and there are some great FX presets in Absynth factory library you should explore. Instead will look into more specific features of Absynth FX such as using it for envelope following, complex gate sequencing, stereo effects, transition effects and also how to trigger envelopes in Absynth with external audio. Each oscillator in Absynth can act as an external audio input. For this to work you must load Absynth FX in your host which is an audio effect version of Absynth. Choose Audio In mode for the oscillator. By default it is in mono mode and Input 1 represents left channel in your DAW. If you choose Stereo mode then Input one is left channel and Input 2 right channel in your host. Let’s first create simple dry/wet control in Absynth. We will use Channel A in Absynth for dry signal and Channel B for wet, effected signal. Right click on a volume slider for both channel A and Channel B and set them both to be controlled by Macro 1 slider. Go to the Perform tab and choose Assignments menu. Invert the modulation for Channel A Vol like in the picture below. Here we go, now we can easily fade between dry and wet signal with Macro control 1. Absynth is great for using it as a simple effect processor for example for creating filter sweeps. Let’s say we want to create 8 bar long filter sweep. 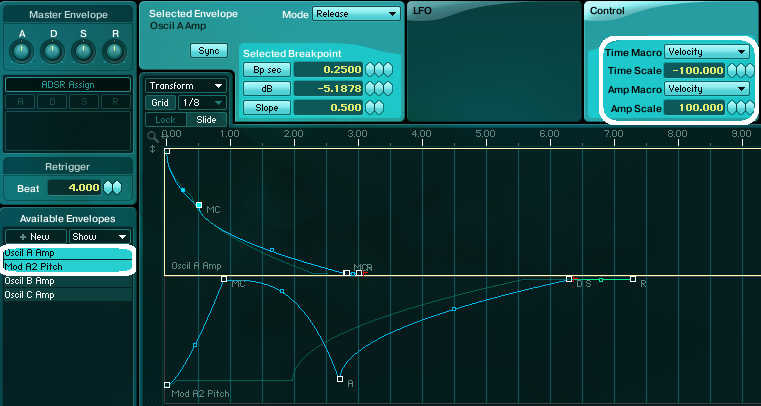 Sure we could automate the filter movement but we could also use internal Absynth envelope which offers some advanced features such as envelope LFO. For triggering the envelope you should route MIDI track in your host to AbsynthFX unit and trigger the envelope with a midi note. Here is sample of basic unmodulated waveform from Massive going into Absynth FX and in the second part of the sample you can hear processed vocal sample. We can also use Absynth as a gate effect. We could simply trigger the envelopes with short notes from midi channel in your host. Since you can control the envelope slopes with velocity we can make some quite complex gating effects. Here I have assigned the time and amplitude of volume envelope of oscillator A to velocity and also frequency shifter’s pitch effect envelope. Now with changing velocity values you can get some interesting and complex gating effects. Another much more interesting way to obtainn gating effects is to loop the envelope and sequence it from within the Absynth. This can produce some really good results since you can loop envelopes for any parameter in Absynth. Be sure to put envelope in Loop mode like in the picture below and then trigger the envelope with single midi note. The envelope will be looped as long as the note is held. 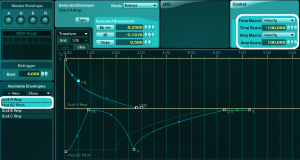 What about using amplitude envelope in LFO mode? This can produce tremolo and stutter effects and with changing the envelope in LFO mode settings for each breakpoint even more complex effects can be achieved. Here is raw noise waveform from NI Massive synth. I have automated Color parameter in Massive over the 8 bars and the complex, changing amplitude modulation you hear on the signal is from Absynth. Now this is another very very cool and useful technique. With Audio Mod function you can derive modulation signals from audio signals. 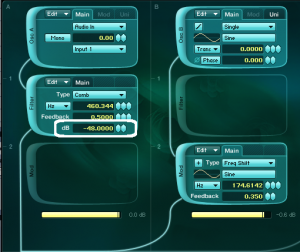 You can control almost any parameter in Absynth with the amplitude of the incoming sound. To do that you must go to the Perform window in Absynth and then choose Audio Mod tab. Here you can have up to four separate envelope followers. The signal from which the modulation signal will be derived can be chosen from any point in Absynth signal path with Modulation Source drop down menu. You can choose your control signal to be derived from oscillator module slots, from audio module slots, from master slots or from master effect slot. Also you can trigger envelopes with external audio signals. You must choose which envelope you will be triggering by selecting it from the Trigger Module source menu as you can see in the picture below. Also you have to set threshold parameter with the slider below and when exceeded the envelope is being triggered by audio signal. Let’s look into simple example to make things more clear. We have a simple drum loop with comb filter. We want frequency of the comb filter to be controlled by the amplitude of our drum loop. 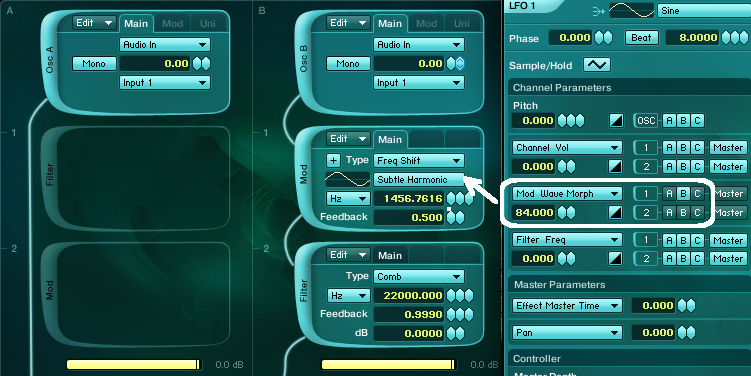 Right click on the filter frequency control and choose Audio Mod A from the drop down menu. Now we are controlling the frequency of the comb filter with external audio amplitude, higher the volume of our drum hit higher the frequency of the comb filter. You can control the amount with which you affect the modulated parameter (filter frequency in our case) and you can also invert the modulation so higher the amplitude gets lower the frequency goes. On the right side of Audio Mod A control panel we have few controls we can tweak. We can adjust the overall strength of the input audio signal before it is “sampled” with Gain dB parameter if the signal is to0 strong or low. The attack parameter determines how quickly the extracted control signal follows the upward movements of the audio signal and decay controls how quickly it follows the downward movement. With this two parameters you can smoothen the generated control signal so the changes are not so abrupt. With Post Env switch you control if the control signal generated from audio signal is “sampled” before or after the amplitude envelope of Audio In oscillator. First four bars are non-processed drum loop,in second four bars you can hear Comb filter frequency affected by the sample amplitude, in the third four bars again comb filter but with inverted modulation, and in the fourth four bars you can hear Cloud Filter Transpose modulated with amplitude of drum loop and in the last four bars the amount is again inverted. Envelope triggering is useful if you want for instance use external sound to trigger audio oscillators. 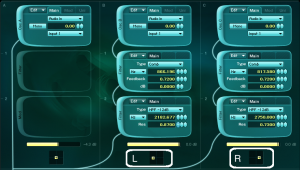 So you can follow any rhythm for example with oscillator or filter envelopes in Absynth. Note that the attack and decay settings affect the signal before it is being used for triggering the envelopes so you can use this control to adjust how fast or slow it is triggering the envelopes. In this simple example I am using audio signal from Oscillator A to trigger the amplitude envelope of Oscillator B which is a ring modulated sine wave. We dont hear channel A (the comb filter is used for silencing the audio input) we only hear Osc B which amplitude envelope is triggered by Osc A Audio input signal. Here are two same samples but with different Attack and Decay settings for Audio In envelope following so you can hear the difference it has on triggering envelopes. Another great use of Absynth as an effect is to use it as a transitional effect for your drum combo or maybe even on whole master channel. There are two ways we could do this. One is simply assign each parameter we want to modulate for transition effect and create let’s say 8 bars long envelopes for parameters we want to control. In this sample I have Absynth FX on master track. In Absynth I am using three 8 bars long envelopes, one for dry signal (Audio A amplitude envelope), one for wet signal (Audio B amplitude Envelope) and one for frequency shifter pitch parameter as you can see in the picture below. Also I have triggered the envelopes in Absynth by routing midi to Absynth FX unit to restart all the envelopes at once. No other effects or automation used. The other more flexible way is to assign envelopes to be controlled with Macro sliders in Absynth. 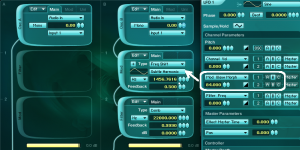 On the “wet” channel in Absynth I have two effects, Frequency Shifter and Comb filter. We want to automate the Frequency Shifter Frequency parameter and also the Comb filter Frequency and Resonance (Feedback) parameters. Here you can see these three envelopes which are all set to Control Mode controlled by Macro 2 slider. Macro 2 is then automated in Ableton to go from midi CC value 0 to 127 over 16 bars. So you can draw any shape you like and don’t have to worry about the envelopes length since the envelope in control mode is controlled by midi values.So midi value 0 represents the start of the envelope and midi value 127 represent the end of the envelope. Now the envelopes can be different in length and as long as you control them with the same macro they will start and reach end at the same time. I have also Macro 1 controlling the dry/wet amount of the effect like we did in very first example in this tutorial. 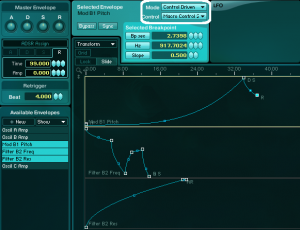 You can create quite complex transitional effects for your tracks. Here are two examples of this technique but also with different waveforms than sine loaded in Freq Shifter effect. I have used two different morphable waveforms which I am morphing with LFO1. No other automation, filters or effects used. Also some cool stereo effects can be created from mono signal such as you kick and bass combo for example. So we can have channel A as a Dry signal input and Channel B and C both as a wet signal but one panned to left and the other one to right. Simply assign channel A as dry signal and channel B and C both as wet signals to Macro 1 so you can fade between channel A and channel B, C.
I have used same effects for L and R channels but with a bit different settings and also with a bit different envelope shapes for Comb filter frequency parameters on both of the channels. Both of the filter frequency envelopes are controlled with Macro 2. This way you can produce some cool stereo effects from mono signal. Hope you have learned something new from this tutorial. With some more careful tweaking you can get some very unique results with these techniques so try to experiment as much as you can. If you have any question, comments or tutorial suggestions please feel free to contact us here or via our Facebook page.